With SpectraLayers Pro 5, you can visually work with the individual sounds in an audio file. Rearrange, extract and optimize sounds in ways never imagined thanks to the unique layer concept for the frequency spectrum. SpectraLayers Pro transforms sound into a unique multidimensional visual world of audio data. 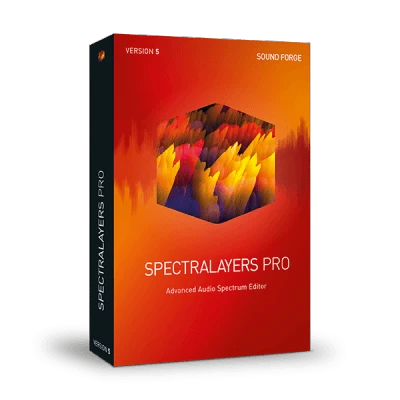 Outstanding program design, a high-performing audio engine and seamless integration with other DAWs makes SpectraLayers Pro one of the world’s most revolutionary spectral editing platforms on the market. New buttons, direct editing of wave samples and volume control for groups are just some of the new program features. A preview is now available for every tool to illustrate its functionality before it’s used. Use the frequency spectrum of one layer as a cast for the overall mix. Using Spectral Casting, seamlessly integrate elements such as vocals into an existing mix by precisely "blanking" overlapping frequencies. Spectral molding uses frequencies to materialize crosses between recordings for creative sound design. For example, imagine a guitar recording with an acoustic texture of vocals! SpectraLayers enables you to identify noise within a waveform in a matter of clicks and save it as a noise prints. This "print" can then be used for various types of noise reduction. "I love using SpectraLayers Pro to help create Sounds that appear to spring naturally from another dimension. I can deconstruct and reconstruct familiar as well as unidentifiable sounds into shadows or translucent projections with its unique tools and structure." Dane A Davis, Präsident Danetracks, Oscar-Gewinner für "The Matrix"
"The ability to interact with audio on such a new and graphical interface opens up incredible potential for both restoration and sound design." "SpectraLayers Pro provides a unique toolset for visualizing and manipulating sounds the way we actually perceive them. No other application on the market can match its potential for true creativity.! "We had the pleasure of working with British composer Harry Gregson-Williams on the score for Total Recall. During the programming and sound design sessions, SpectraLayers became an indispensable tool for manipulating audio in ways no other software we've come across can come close to. We had enormous fun extracting layers of sound from organic recordings and layering them up to form otherworldly futuristic textures for the score." From small fixes to radical, project-wide transformations, use SpectraLayers Pro to repair, filter, and remix audio in ways you never thought possible. Apply bandwidth-limited noiseprints across entire files, or perform surgical cuts to remove isolated sonic events. Audio extraction is a SpectraLayers Pro specialty. Pull target sounds for analysis, replacement, or rights management purposes. In contrast to the Delete function, the "Heal Action" reconstructs various types of background noise. Repair damaged frequencies by dragging from one end of the frequency to the other. You can now draw Spectral Markers and Spectral Ranges and save them to the project files. It's especially useful for a forensic workflow.